Home » Posts Tagged "Faith"
Why did God choose to do it this way? Theologically, I can answer that question. But at the time, it hit me personally. You see, over the past months, Jim and I have been going through a major life change. After we sensed God calling us to leave our church of 17 years and move out of our community of 22 years and start a new business, we set out on an adventure. Not sure where we should live, we have been “trying out” an area. (Currently, Indianapolis, Indiana) Over the past nine months we have lived for 2 months with my brother and sister-in-law, 4 months in a furnished one bedroom apartment, and just finishing up 3 months in an Air BNB house. Next we will be living in another house in another state for the first 2 months of the year and then we don’t know exactly where we are going. At the same time, we are working to build a business which has ups and downs of its own. Now here me, I’m not depressed or discouraged. If fact, I enjoy living a faith-filled life out on a limb. Let us say that we are thankful for the contracts and work we have received for 2018 and are truly enjoying the adventure. We are genuinely excited with anticipation for what is to come. God continues to deliver on His promises and is working on our behalf. But some days I do ask God, why did you choose to do it this way? This whole process could have been a lot smoother. He could have told us exactly where to live, and we could have contracts overflowing in our inbox. But I was reminded on Saturday night, God doesn’t always provide an easy way, but He does provide a way, and He does it for a very specific reason. God doesn’t make mistakes. And if He chose to send His one and only Son to earth in such a difficult and unusual way, then who am I to expect to have everything handed to me on a silver platter? and He does it for a very specific reason. Maybe you are going through some questions of your own where you can’t understand why God would choose to do it this way. You’ve lost a loved one and are feeling lost and broken. Maybe, you simply need to see this from a heavenly perspective rather than from where you are. 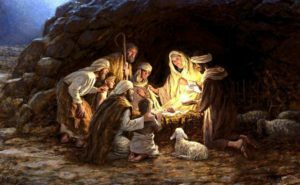 We are not promised all our wants – only all our needs (The Christ-child still had shelter. It was not in a palace or even in an inn. But Mary and the child found warmth and protection in a humble stable.) In Isaiah God does promise, “I will make a way in the wilderness and rivers in the wasteland.” We claim this to be true even now as we walk in faith. So what can we do about our circumstances? Live thankful. No matter your circumstance, there is always something to be thankful for. I’m amazed at how some people who are in the worst situations of life find ways to be thankful and joyful. Stay Positive. You can choose to accept the negatives and lean into the positives. Then you can tackle your circumstances from a position above them rather than below. Serve Others. True significance is lived out in serving others and helping lift their life in some way. God may not be moving in your life the way you anticipated that He would, but He is at work. You can still remain present and active in that journey. Merry Christmas and Live a Legacy!